Nah, we need a trilogy that is just the phantom menace spread out over three movies. Jar Jar needs more screen time. There was only one fart joke in the phantom menace, I demand at least three in this trilogy!!! @Archmage Araketh, You say that like it wouldn't be good. IMAGINE THE MEMES, MAN!!! You think prequel memes are good? 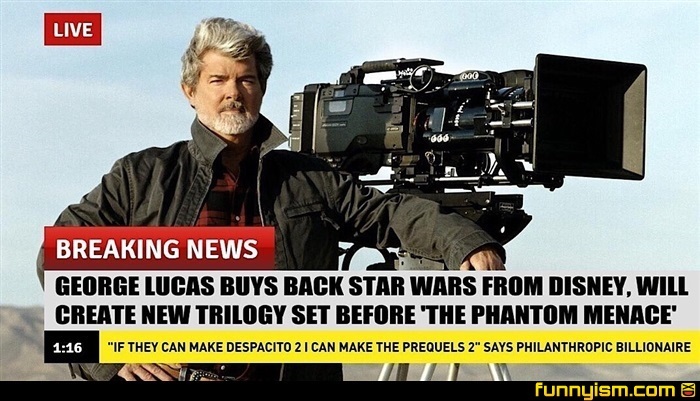 Just wait for preprequel memes. @The Senate, This is where the fun begins! As long as he gets rid of the sjw crap. @wannabe firefighter, as someone who generally agrees with you, I’d give him a chance. Maybe he’s not a terrific director, but he make some good story. Does it have a scene with schmii skywalker being impregnated by the force?? ?